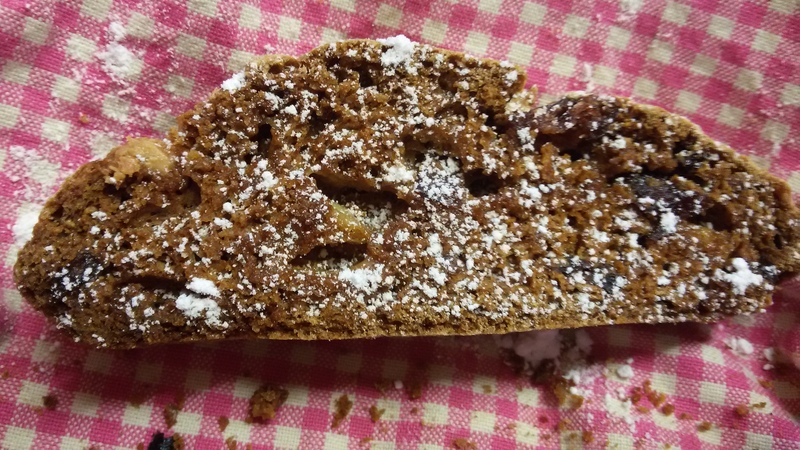 The signature challenge this week was ‘Biscotti’. Ok, so that really is a challenge as I have never made any, and I’m not sure I have eaten any as I am not a coffee drinker. However, I watched and played with flavour ideas – each seemed to be matched by a contestant. So I decided upon carob as an alternative to chocolate to be teamed up with brazil nuts. I have a huge bag of Brazil nuts in my baking cupboard, carob was a little more difficult to get hold of in my small provincial town. Change of plan needed. So I re-strategised: when, as a non coffee drinker am I most likely to want to serve biscotti? Christmas! We have a Christmas tradition of sitting in front of the fire after our post-crib service bath, opening out first Christmas present (new pyjamas) and drinking hot chocolate whilst listening to the story of the Real Father Christmas. 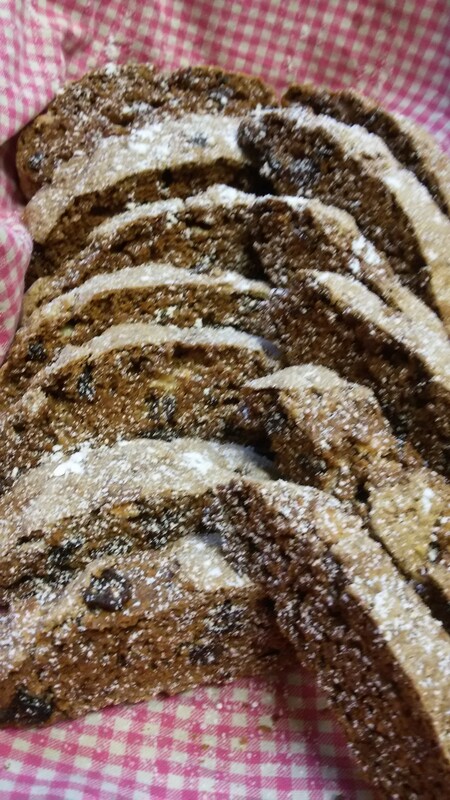 Biscotti would be a great alternative to marshmallows, to serve up with the hot chocolate and Father Christmas may like one too. As I write, on a rainy August day, my thoughts are sadly turning to Christmas (I have already seen my first Christmas party Adverts, so why not? ), and the cranberry, white chocolate, cinnamon and nutmeg biscotti are having their first bake (the Italian name literally means twice baked). seemed to go well, and then I ran out of time! An appointment for little one at the ENT dept was obviously more important, so I switched off the oven and returned the biscotti to finish baking on their own. Returning home hours later, I reheated the oven, turned the biscotti over and returned them to the oven. As a family we very much enjoyed them, and have passed some onto Italian friends for a proper assessment. The Technical Challenge looked very much like the palmiers and schnecken I have made previously, so I won’t overload the kitchen with trying that one out, instead I will focus on the Showstopper: a box of biscuits. Although I like the idea of making a huge custard cream shaped biscuit box filled with home made custard creams and jammy dodgers, a friend has challenged me to make a biscuit box shaped as the Ark of the Covenant! I am looking for middle eastern flavours obviously for this one, and so a sturdy rosewater shortbread will form the basis of the box, and I am hoping that pomegranate and fig florentines will fill the brief for the contents. I am not a hundred percent certain that florentines can be classified as biscuits, but as Mary and Paul aren’t around to judge me I’ll give it a go. Pomegranates and figs have huge symbolism for the Jewish priesthood – the 613 seeds of the pomegranate match the 613 Mitzvot (commandments) of the Law, and priests were instructed to embroider pomegranate images into the hems of the robes. The fig tree was known as a place of prayer – so to be found sitting under a fig tree as the disciple Nathaneal was in the gospels, was to be found in prayer.